Below is an article written by Move Forward PT defining concussion and explaining the importance of seeking medical treatment and follow up care post concussion. Concussion is a traumatic brain injury that can cause lasting effects on brain tissue and change the chemical balance of the brain. Concussion may cause physical, cognitive, and behavioral symptoms and problems, both short-term and long-term. Every concussion is considered a serious injury by health care providers. If you have experienced a head injury, seek medical help immediately. 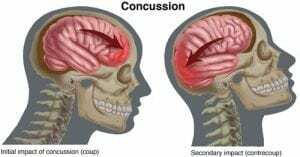 The Centers for Disease Control (CDC) estimates that 1.6 million to 3.8 million people experience concussions during sports and recreational activities annually in the United States. These numbers may be underestimated, as many cases are likely never reported. A physical therapist can assess symptoms to determine if a concussion is present, and treat the injury by guiding the patient through a safe and individualized recovery program. 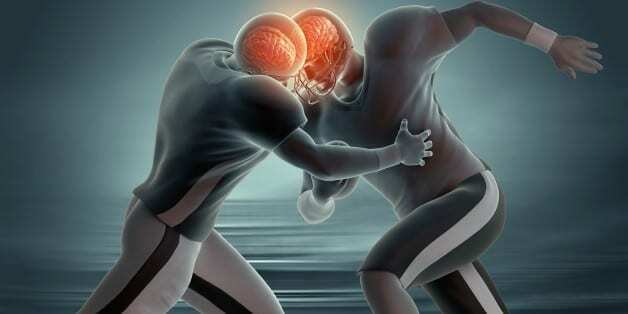 Concussion is a brain injury that occurs when the brain is violently shaken. The injury can happen during rapid movement changes (such as whiplash) or when the head is directly hit. This shaking or hitting of the head causes unpredictable injury to any area of the brain, resulting in immediate or delayed changes in the brain’s chemistry and function. Less than 10% of concussions involve a loss of consciousness. Depending on which area of the brain suffers injury, many different temporary or permanent problems with brain function can occur. Recovery from a concussion can take several weeks to several months and sometimes years, depending on many factors, including severity of the injury and the age of the person affected. Concussion may occur along with other injuries, such as those to the neck and surrounding tissues, which should be managed by a licensed physical therapist. More serious brain injuries, such as bruising, bleeding, or tearing, may also occur and require the immediate care of a medical doctor, such as a neurosurgeon. CAUTION: Concussions can be fatal or can result in permanent brain damage. Seek medical help from a licensed health care provider following any suspected head injury. A concussion is a brain injury; patients living with a brain injury often don’t have the language to express how they feel after injury. Therefore, it is important to work with a physical therapist who gets to know you, your family, teammates, and/or coworkers who may notice any changes in you. There are many symptoms related to concussion, and they can affect your physical, emotional, and mental well-being. Some symptoms occur immediately, some a few hours after the injury, and some show up months or years after a concussion. It is important to seek medical treatment immediately following any head injury. The risk of death or permanent brain damage from a concussion can be minimized by immediate and appropriate treatment from health care providers, like a physical therapist. Only health care providers have the knowledge and training to identify concussion in the maze of symptoms that can occur following a head injury. Some concussion symptoms do not go away in the expected time frame. These symptoms may need further testing and treatment by a team of health care providers, including a physical therapist. Postconcussion syndrome is the term applied to symptoms such as headaches or dizziness that persist for weeks or months after the initial injury. Second-impact syndrome is a serious, although preventable, complication that can occur after a concussion. If a person who has suffered a recent concussion experiences another concussion, permanent brain damage or death can occur. Permanent brain damage can include learning disabilities, personality changes, walking disability, or other brain or nerve disabilities. Research suggests that a person who suffers a second concussion before the initial concussion has healed, has a 100% chance of permanent brain damage, and a 50% chance of dying. An example of second-impact syndrome would be a football player who suffers a concussion in a game, keeps playing, and is hit again; or a person who suffers a concussion from whiplash in a car accident, and then falls at home and endures another concussion very soon after the initial injury. Extreme care should be taken after a concussion to prevent a second injury. Athletes who suffer a concussion during practice or competition must be removed immediately from play, in order to prevent subsequent concussions and second-impact syndrome. A physical therapist will work to develop safe guidelines for return to play, return to work, and return to life’s daily requirements. A longer recovery time may be required for those with a history of prior concussions, eye tracking/movement issues from childhood, migraines, attention deficit hyperactivity disorder, or a learning disability. It’s important to disclose your entire medical health history to your physical therapist. Concussion is most often diagnosed through careful testing by your health care provider, such as a physical therapist. Unfortunately, no single test or tool exists to diagnose a concussion. The diagnosis usually does not rely on hi-tech testing, such as an MRI or CT scan, because brain scans often do not show any brain abnormality, even when the person has symptoms of a concussion. Your physical therapist will ask you many questions to understand all of the symptoms that you are experiencing. He or she also will perform numerous tests to identify problems caused by a concussion, including muscle strength, coordination, balance, sight, smell, hearing, and memory tests. During treatment, your physical therapist will repeat the same questions and tests frequently to gauge your progress and help judge when you can return to work, school, sport, or recreational activities. If you are an athlete who underwent preseason memory (neuropsychological) testing, your physical therapist may collaborate with the health care provider who performed that testing to help determine if you have a concussion. Your physical therapist may also examine your neck for problems following a concussion. Neck injuries can occur at the same time as concussions, and can cause or increase headaches and dizziness. Physical therapists can evaluate and treat many problems related to concussion. Because no 2 concussions are the same, a physical therapist will examine your neurological, orthopedic, and cardiovascular systems in order to best prescribe a routine to address your particular symptoms and your needs in all of your daily environments. Rest and recovery. Your physical therapist will help you and your family understand why you should limit any kind of activity (daily tasks, work, school, sports, recreation, the use of electronics) after a concussion, until it is safe to return to these activities. A period of rest helps the brain heal and helps symptoms clear up as quickly as possible. Your physical therapist will prescribe the rest and recovery program most appropriate for your condition. Restoring strength and endurance. The physical and mental rest required after a concussion can result in muscle weakness, and a decrease in physical endurance. Your physical therapist can help you regain your strength and endurance when the right time comes, without making your concussion symptoms worse. It is common for elite-level athletes and fit “weekend warriors” to experience exercise intolerance with concussion and brain injury. Your physical therapist will work with you to identify and treat your particular concussion symptoms. Your physical therapist will design a therapeutic exercise program just for you, and closely monitor your symptoms as you participate in the program. Stopping dizziness and improving balance. If you have dizziness or difficulty with your balance following a concussion, a type of physical therapy called vestibular physical therapy may help. The vestibular system, which includes the inner ear and its connections with the brain, helps you keep your balance and prevent dizziness. A qualified vestibular physical therapist may be able to help reduce or stop your dizziness or balance problems after a concussion by applying special treatments or teaching you specific exercises, some of which you may be able to do at home. Reducing headaches. Your physical therapist will assess the different possible causes of your headaches, and use specific treatments and exercises to reduce and eliminate them. Treatment may include stretches, strength and motion exercises, eye exercises, hands-on techniques like specialized massage, and the use of technologies such as electrical stimulation. Returning to normal activity or sport. As symptoms ease and you are able to regain your normal strength and endurance without symptoms returning, your physical therapist will help you gradually add normal activities back into your daily routine. Your physical therapist will help you avoid overloading the brain and nervous system as you increase your activity level. Overloading the brain during activity after a concussion interferes with the healing of the brain tissue, and can make your symptoms return. Your physical therapist will help you return to your normal life and sport activities in the quickest and safest way possible, while allowing your brain to properly heal. While initial injuries can’t always be prevented, it is very important to prevent further injuries to those with concussion. The injured person should be closely protected until all symptoms have cleared, and normal activity can resume. Eliminate distractions while driving, such as eating, talking on a cell phone, or texting. Make sure the airbags in your car are in good working order. Absolutely avoid football techniques that increase the risk of concussion, such as “spearing” and headbutting. Avoid or limit “heading” the ball in soccer. Don’t ignore or hide signs of concussion, even in an important game or competition. Report them immediately to your coach. Stay current with state and federal guidelines. Remember that neither helmets nor mouth guards prevent concussions. Clear your walking areas at home of any objects that might increase the risk of falling, such as loose throw rugs, dropped objects, loose flooring, torn or rumpled carpets, and pet toys or dishes. Make sure that all traffic areas in your home are well-lit. Avoid exposure to blast explosions and violent events. Do not shake babies, or anyone of any age! It is imperative to prevent second-impact syndrome after an initial concussion. The injured person should be closely protected until all symptoms have cleared, and normal activity can resume.